Charles Benham was the son of a G.P. and followed his father into the medical profession, becoming an eminent doctor in Hove. He volunteered for overseas service and was sent to Salonica where, after nine months, he became ill and was transferred to Malta, where he died with a hepatic abscess. Rather than join the family business, Henry trained as a doctor. In 1873, he married Eleanor Anne Adnams in West Ham; her brothers, George and Ernest, had founded the Adnams Brewery business at Southwold, Suffolk in 1872. The family settled in Ipswich and in 1881 were living at 27 Museum Street, from where Henry practiced as a doctor. James and Eleanor had two further sons after Charles, both of whom died shortly after birth, followed by two daughters, Eleanor (born 1882) and Ellen (born 1885). It seems that James and Eleanor then left England and moved to Paris, where a third daughter, Margaret, was born in 1888. At the 1891 census, Charles, a 16-year old scholar, was a boarder at the home of Robert Edmund Younger, a retired chemist at 35 Lower Brook Street, Ipswich, a 20-minute walk from Queen Elizabeth’s School. On 4 April 1900, Charles married Alexandra Alice Roussin at Christ Church in New Road, Brighton (now the Brighton Unitarian Church), with Revd. Thomas A. Garton officiating. Alexandra had been born in Norwood, South London in 1872, the daughter of Louis Roussin (1836–1889), an immigrant merchant from Greece. Charles was educated at Queen Elizabeth’s School, Ipswich before going to University College Hospital, London, where he was described as a “brilliant” student. He graduated with MB in 1897, obtaining his doctorate (MD) two years later. At UCH, he also obtained other medical qualifications including Membership of the Royal College of Surgeons (MRCS) and the diploma of Licentiate of the Royal College of Physicians (LRCP), becoming a full member (MRCP) in 1908. After graduating, he acted as a house-physician at UCH before becoming resident medical officer of the Brixton Dispensary in South London. He specialised in pathology and bacteriology and, after going into general practice in Hove – his surgery was at the family home in Sackville Street – his services were often utilised at the Royal Sussex County Hospital. He was chairman of the East Sussex Medical Committee and held many positions at the British Medical Association, including as chairman of the Brighton Division and secretary of the Bacteriology and Pathology Department in 1913. He also became involved in civic affairs, becoming a member of Hove Town Council where he served on several committees including the Education Committee, and was chairman of the St Elizabeth Guild of Education. Charles Benham was initiated into Hova Ecclesia Lodge No 1466, meeting at the Old Ship Hotel, Kings Road, Brighton, on 14 February 1908, passed to the 2nd Degree on 13 March, and raised as a master mason on 10 April. Charles was rapidly promoted in the lodge, becoming inner guard later that year, and progressing through the offices until he was installed as Worshipful Master for the 1913–14 year. In the Lodge minutes of 16 March 1916, on the 1st rising: ‘The Senior Warden proposed that the collection that evening be sent to the Mayor of Hove for the fund which he is raising for the hospital at Salonika, in response to the request of Wor. Bro. C H Benham’; this was seconded by the Junior Warden and carried. The minutes of the Lodge dated 14 December 1916 state that the Worshipful Master rose and referred in sympathetic terms to the death of Wor. Bro. C. H. Benham whilst on active service in Malta, expressing the deep sympathy of all the Brethren with the widow and children in their sad bereavement. He said that in the name of the Lodge he had written an expression of their sympathy to Mrs Benham and now proposed a resolution ‘that the Brethren of the Lodge desire to place in the minutes an expression of sympathy with the family of the late Brother in their bereavement, and of the loss sustained by the Lodge by the death of Wor. Bro. C. H. Benham’; this was seconded by Wor. Bro. E. H. Enys and carried in silence, the Brethren upstanding. On 27 April 1908, Charles joined the 2nd Eastern General Hospital in Brighton with the rank of captain in the Royal Army Medical Corps (Territorial Force). I beg to submit that I am willing to serve in a base hospital abroad. I have some experience of bacteriology and vaccine therapy … and my services would be more useful on the medical rather than surgical side. On 18 April 1916, Charles was promoted to major in the RAMC. On 25 September 1916, he was admitted to the 29th General Hospital as a patient with dysentery. He was initially diagnosed with malaria but failed to respond to treatment and on 8 October he was transferred on board Hospital Ship Essequibo to Hamrun Military Hospital at Malta, arriving there two days later. In Malta, his health continued to deteriorate and on 21 October he was reported as “dangerously ill”. On 31 October, the diagnosis was amended to “amoebic abscess of the liver”. 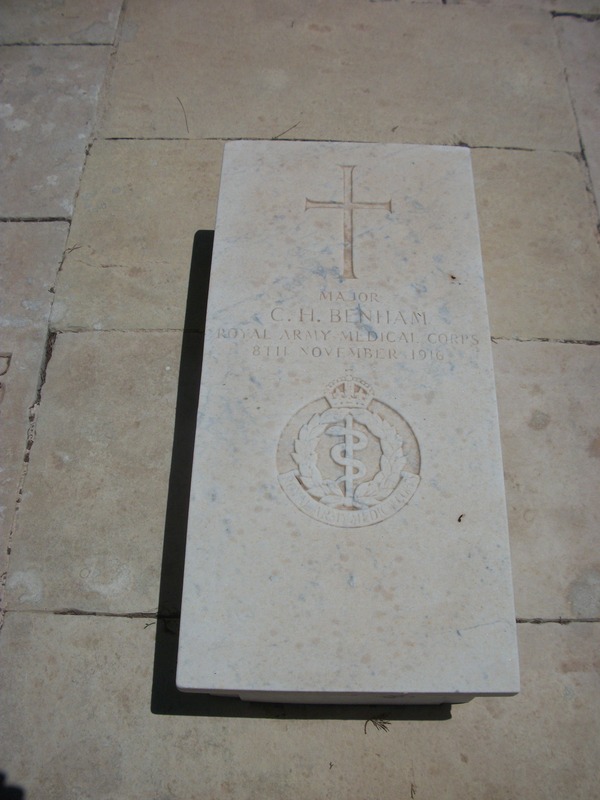 Charles Benham died on 8 November and was buried the following day at Pieta Cemetery. The service was conducted by the Revd. Ernest Edmonds-Smith, Senior Chaplain to the Forces in Malta. The earth is shallow on Malta and the graves at Pieta Cemetery had to be cut into the underlying rock and are marked by recumbent markers. His deep sense of duty and patriotism led him to offer himself for duty abroad, and his death in the cause of his country is deeply regretted by his colleagues, his friends and his patients. As well as the Masonic Roll of Honour, Major Charles Benham is commemorated on the World War 1 Memorial at Hove Library, and on the Ipswich School war memorial. Charles’s kit and personal effects were sent to his widow shortly after his death. This included his masonic apron and three pairs of white gloves. Charles’s widow, Alexandra never re-married and died at Chalfont St Giles, Buckinghamshire on 17 January 1941. Charles’s mother, Eleanor, had died in Paris in 1915 and in March 1920 in Lausanne, Switzerland his father, Henry, re-married to Eleanor’s sister, Annie. Henry died in Switzerland in December 1922. Charles’s second son, Harold died in Croydon in February 1933, aged 25. His other children all lived into the late 1970s or 1980s. The National Archives: WO 374/5702 Major Charles Henry BENHAM. Royal Army Medical Corps.